Saturday, April 13, 2019 – Allstate Arena, Chicago, Ill. 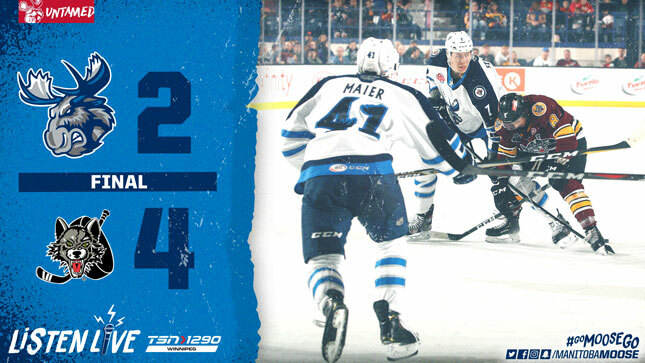 The Manitoba Moose (38-30-5-2) saw their late-season push for the playoffs come to an end with a 4-2 loss to the Chicago Wolves (44-21-6-4) at Allstate Arena on Saturday evening. The goaltenders were busy in the opening frame with Mikhail Berdin making 12 saves and Oscar Dansk turning away 14 Moose shots. The Wolves scored the lone goal of the frame, and it came from a familiar face. Former Moose forward Tye McGinn accepted a pass from T.J. Tynan and snapped the puck five-hole for the opening goal with 3:17 left in the first. The Moose controlled the play in the second period, outshooting the Wolves by a 13-2 count in the frame. Unfortunately for the visitors, one of Chicago’s two shots found the back of the net. Winnipegger Cody Glass set up Nic Hague who ripped a shot from the point past Berdin. With their playoff hopes on the line, the Moose went to the third period trailing 2-0. Glass factored into the outcome again early in the third, putting away a rebound 2:15 into the frame to give Chicago a 3-0 lead. With time running out, the Moose caught a break with two Wolves penalties called on the same play, including a double-minor. The two-man advantage was immediately cut down to four-on-three by a Moose penalty eight seconds into the advantage. The extra space on the ice gave Mason Appleton room to find a seam and set up Cameron Schilling for a one-timer to get the Moose on the board with 8:11 to go. Logan Shaw got back on the ice after serving his penalty and cashed in on the second-half of the double-minor to get the Moose within one with 6:58 to go. Manitoba continued to push, but a broken stick on a point shot resulted in Keegan Kolesar capitalizing into an empty net to give Chicago the 4-2 win. With Iowa and Milwaukee winning tonight, the Moose have been eliminated from the Calder Cup Playoffs picture. Seth Griffith reached the 40-assist mark for the second time in his AHL career. Mason Appleton extended his point streak to seven games, with eight points (4G, 4A). The Moose wrap up their season tomorrow afternoon against the Wolves in a 4 p.m. CT matchup that can be heard on moosehockey.com/listenlive, the Moose App and streamed live on AHLTV.